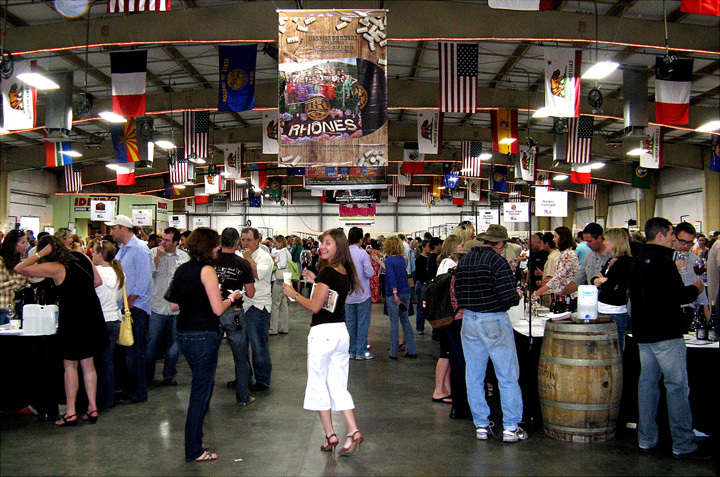 Report on the 18th annual wine tasting presented by Hospice du Rhône (HdR), on Friday April 30th and Saturday May 1st, at the Paso Robles Event Center in Paso Robles, California. The event is the largest celebration and tasting of Rhône-varietal wines in the world. As always, the festivities kicked off with the “Rhône-n-Bowl” bowling tournament on the evening prior to the main event. Event attendees had to rise early the next morning as HdR continued for the next two days with seminars, lunches, an auction, and tastings, and concluded with a farewell barbeque on Saturday evening. In addition, there were peripheral events such as the Thursday “Syrah Shoot-out” and a new Friday night event called “Sommelier Soirée,” not to mention the traditional late-night partying at the Villa Creek bar in downtown Paso Robles. Hospice du Rhône is a non-profit organization whose purpose is to “improve the business conditions of the grape growers and wine producers of Rhône variety wines and grapes throughout the world.” The group helps to promote Rhône-varietal wines, with a motto of “22 Varieties, 1 Vision.” Founded in 1993 by Mat Garretson as The Viognier Guild, the first gathering of the group was in Georgia (where Mat lived at that time). Vintner John Alban, who attended that inaugural event, became Mat’s partner in the organization, and it soon moved to California and changed its name to reflect a broader vision than strictly Viognier. Mat and John worked hard to attract Rhône varietal producers from around the world, and the seminars and tastings are now recognized as among the best at any wine event. Combined with the sense of fun that pervades the weekend, it has become many winelovers’ favorite annual gathering. Mat stepped down from leading HdR last year, but John continues to lead it, along with Director Vicki Carroll and her dedicated staff. Year after year, HdR is a wine experience not to be missed. The tasting notes below are from both the Friday “Rhône Rendezvous” Tasting and the Saturday Grand Tasting. This was the first year I attended the Friday and Saturday morning seminars – thanks to HdR Communications Director Faith Wells – and there were also a number of wines tasted there. The seminars and their wines are covered separately as part of the overall HdR Grape-Nutz report. Hospice du Rhône offers perhaps the best opportunity to taste top US Rhône-style producers along with representative wineries from France, Australia, and elsewhere. Most wines poured during the two big tastings on Friday and Saturday were current releases, though a number of wineries graciously opened library wines and others offered previews of wines to be released over the coming year or so. As noted above, I attended the four HdR seminars this year. “We’ve Come a Long Way, Baby: The Past, Present, and Future of South African Syrah” kicked things off Friday morning, with Wine Spectator’s James Molesworth moderating a panel of five South African producers. Following that was “Côte Rôtie: The Next Generation” with John Alban hosting Stéphane Ogier of Domaine Michel & Stéphane Ogier. Saturday morning started off with a bang, as Mutineer Magazine’s Alan Kropf gave the full rock-star introduction to K Vintners’ Charles Smith for “Washington State: The Perfect Haven for ‘The Ultimate Terroirist’.” Wrapping up this year’s seminars was “An Incredible Cambie-nation,” with Jeb Dunnuck of The Rhône Report moderating a panel of Châteauneuf du Pape producers Vincent Maurel of Clos Saint Jean and Michel Tardieu of Tardieu-Laurent plus renowned wine consultant Philippe Cambie. The seminars were entertaining (particularly Charles Smith!) and educational, with some exceptional wines, among the best poured at the entire event. The South African Syrahs were quite different from their southern hemisphere cousins in Australia, and Stéphane Ogier presented a line-up of absolutely stunning wines, while the K Vintners’ Syrahs did a fine job of showing off their distinctions, and the Châteauneuf producers’ Cambie-influenced wines displayed both similarities and interesting contrasts. I can’t forget to mention the wonderful Friday and Saturday morning breakfasts, by new Paso Robles restaurant Thomas Hill Organics, and lunches, by Sonoma’s The Girl & The Fig. Many fine Rosé wines from Syndicat Tavel were served at the Friday lunch, while Saturday’s lunch was paired with Wines of South Africa. The Saturday lunch was followed by the auction, which featured a variety of auction lots, including wine, dining, and tours. A first for HdR this year was their introduction of “iRhône” – an application for mobile devices. Among the helpful features is a list of over 1,000 wines poured at HdR, enabling you to sort by producer, variety, region, or a combination of the three. This was very handy to use before the event, and helped me to plan my strategy for getting to the producers and wines I was most interested in checking out. Even with the economy in the shape it’s in, the turnout seemed pretty good, though the afternoon tastings were not as packed as they have sometimes been in past years. There were only a handful of times that tables were too crowded for me to step right up to get a taste, and when that was the case, it took only a few moments for space to open up. A number of gourmet food exhibitors were on hand as well, though I must confess I was more focused on the wines and didn’t take much advantage of the tasty-looking food that was on display. It should also be noted that HdR produces the most thorough tasting guidebook of any event I’ve attended, a big help during the weekend and a nice souvenir to take home. Besides a large number of California wineries pouring at the tastings, there were producers from Arizona, Oregon, and Washington and from six other countries – Argentina, Australia, France, New Zealand, South Africa, and Spain. From the HdR event guide, I counted over 200 separate producers represented at over 140 winery and importer tables at the tastings. After seeing fewer than the usual number of French producers last year, this year the number was back up noticeably – a most welcome development. And though there were a handful of domestic producers that usually make it to HdR who were missing this year, there were still plenty to choose from. As usual with such a large event, it’s impossible to get to all the wineries I would have liked to. I decided to skip many wines I had tried at other recent tastings (including Big Basin, Jemrose, Skylark, and Tercero) and winery visits (including Ampelos, Caliza, Carina, and Terry Hoage). And I wanted to take advantage of the great line-up of French producers pouring this year so I spent a good deal of time at their tables. But of course there were still a number of tables I’d hoped to get to but ran out of time, and as a result I didn’t have much time to check out newer wineries this year. In a tasting such as this one, it’s always a challenge to recalibrate my palate as I go from big wines to more subtle ones and back again, and then try to jot down any meaningful information in my notebook. This was a point that was hammered home by the more relaxed tastings at the seminars, where it was possible to taste wines over the course of an hour, compare them directly to one another, and revisit them. But each tasting venue has its value – it would be impossible to taste so many wines from all over the world in a short time except at events such as the afternoon HdR tastings. Overall, I enjoyed the afternoon tastings this year more than I have in some time, and I found more than the usual number of standout wines, especially among the reds. There really were some excellent Rhône-style wines for every palate preference. I thought some of the bigger wines this year showed a bit more restraint, even finesse, than I’ve experienced in awhile, and I was particularly impressed with many of the French wines that were poured. While there were some wonderful library wines poured at HdR – notably from Jaffurs, Lagier Meredith, and Qupé – the “Highlights” listed here are selected from current and soon-to-be-released wines poured at the two main afternoon tastings (I could have included many more from the seminars as well). Hospice du Rhône is more than the sum of its parts, and often the meals, wines, and good times shared with old and new friends outside of the event itself are as memorable as the tastings, if not more so. HdR bills itself as a “celebration of Rhône variety wines,“ and I can’t think of a more appropriate description than celebration. If you’ve never attended, you owe it to yourself to try and make it next year. 2004 “Agharta,” North Coast. 92% Syrah, 5% Grenache, 1% each Viognier, Roussanne, and Marsanne, mostly whole-cluster fermentation, aged 58 months in French oak. Dark color, dark fruits with loads of spice and a touch of earth, bright and lively in the mouth, and a very big tannic finish, nice. Poured at the Wind Gap table. Comments: This is a project from Wind Gap’s Pax Mahle, utilizing very long barrel aging for this wine. 2007 Mourvèdre, Blue Oak Vineyard, Santa Barbara County. Medium-dark color, blueberry and plum aromas with some earthy notes, nice intensity and a big, chewy tannic finish. 2007 “GSM,” Paso Robles. Medium-dark color, red fruits with spicy oak, lively mouthfeel with grippy tannins. 2007 Mourvèdre, Hastings Ranch, Paso Robles. Medium purple color, ripe black cherry and dried herbs, medium-bodied with some youthful tannins on the finish. 2005 Syrah, “Hommage a Max,” Santa Ynez Valley. Medium-dark color, earthy, leathery dark fruits and spice, fairly big but lively on the palate with moderate tannins. Quite an interesting wine, and one I’d love to revisit in ten years. 2009 Chardonnay, Green Valley Vineyard, Napa Valley. Bright aromas of citrus and green apple, great purity of fruit, medium weight on the palate with bright acidity and clean finish. Comments: I’d tasted the rest of the excellent current Arnot-Roberts wines at the Rhone Rangers tasting, so I only tried this one wine, not exactly a Rhône but very distinctive for a California Chard. 2007 “Cuvée Jean Marie,” Vacqueyras, Medium color, plum and blueberry with some spice notes, fruit-forward style with fairly rich mouthfeel and moderate tannins. Poured at the Rhône Valley Wines table. 2007 “Hope,” California. 37% Petite Sirah, 36% Syrah, 17% Grenache, 10% Mourvèdre. Medium purple color, pretty floral aromas along with black cherry and plum, and notes of grilled meat, black pepper and earth. Medium-bodied with good acidity in the mouth and a fresh, lively finish, very nice. Comments: An interesting and impressive blend from a winery that was new to me. 2009 “Vine Starr White,” California. 50% Chardonnay from James Berry Vineyard, 25% Roussanne from Ellen Ridge Vineyard in El Dorado, and 25% Picpoul Blanc from Luna Matta in Paso. Light straw color, ripe stone fruit/apricot, very lively acidity on the palate with a smooth finish. 2009 Roussanne, El Dorado County. Tank sample. Made in an “orange wine” style, spent 18 days on the skins. Medium-light color, with pretty floral and orangepeel aromas, plus some stone fruit and spice. Moderately rich mouthfeel with a little tannic bite on the finish, distinctive and very nice. 2009 “Carbonic” Carignane, Alexander Valley. Tank sample. Medium-light color, bright, candied red fruits on the nose, lively in the mouth, and a hint of sweetness on the finish. 2008 Mourvèdre, Luna Matta Vineyard, Paso Robles. Vibrant purple color, with black cherry/plum fruit, plus game, spice, and earth components. Medium-bodied and good structure for cellaring, nice. Comments: Chris Brockway is constantly experimenting with different winemaking methods, and his Carbonic Carignane and long skin-contact Roussanne were among the most distinctive wines of the entire event. 2007 Syrah, Humboldt County. Sourced from three of the Cabots’ vineyards, aged mostly in older oak. Pretty floral notes along with savory, peppery dark fruits, this was a fairly big wine with youthful tannins. 2006 Syrah, “EXT,” Humboldt County. Extended barrel aging, about 30 months total. Medium-dark color, with smoky, meaty character, along with plummy fruit, spice and a lot of black pepper. Tightly-wound, this had medium body with good structure. 2007 Syrah, Kimberly’s, Humboldt County. Medium-dark color, lots of bacon/smoked meat character along with blackberry and herbs. Medium-bodied with a lively finish. 2008 Syrah, Reed’s Humboldt County. Barrel sample, from a three year-old Mercurey barrel. Dark color, more intense bright fruit than the ’07 Kimberly’s, showing boysenberry and plum along with smoky, meaty notes and black pepper. Bigger on the palate, with chewy, youthful tannins. Comments: Overall the Cabot wines showed somewhat tight this year, but I suspect with time they will emerge and become just as impressive as the wines they poured at last year’s event. 2008 Rosé, Kick Ranch, Sonoma County. Grenache, Mourvèdre, Counoise, Cinsault. Light pink color, watermelon and spice, bright on the palate and a slight tannic bite on the finish. 2007 “Temptation,” Kick Ranch, Sonoma County. Dark color, intense ripe plum and darker fruits with spice and chocolate notes, rich mouthfeel and big, puckery tannins. 2007 Syrah, Kick Ranch, Sonoma County. Dark color, plum/blueberry with a mocha note, dense, creamy texture, with a chewy tannic finish. Comments: Both Carica reds seemed promising but will need some age to show their best. 2006 Châteauneuf du Pape Blanc. Medium yellow color, stone fruit, pear, and honey aromas, rich and creamy in the mouth, smooth finish.Poured at the Vineyard Brands table. 2007 Châteauneuf du Pape. Medium-dark purple, bright raspberry and plum with touches of earth and spice, medium-bodied with good structure. Obviously just a baby, and showing somewhat tight right now but everything is there for a great future. Poured at the Vineyard Brands table. 2008 “Rhône Paradox,” Costières de Nîmes. 50% Syrah, 20% Mourvèdre, 15% Grenache, 15% Carignane. Medium-dark color, meaty, earthy red fruits, full-bodied in the mouth with chewy tannins. Poured at the Rhône Valley Wines table. 2007 Saint-Joseph. Medium-dark in the glass, meaty, savory, black fruit and anise/spice, very nice texture on the palate with medium tannins, very nice. Poured at the Rhône Valley Wines table. 2007 “Blueprint” Shiraz, Stellenbosch, South Africa. Medium-dark color, meaty, plummy aromas, bright and lively in the mouth, moderate tannins. Poured at the Mullineux table. 2007 Shiraz, Stellenbosch, South Africa. (see seminar TN on this wine) See the separate Friday seminar report. 2008 Château de Bord Côtes du Rhône Villages Laudun Blanc. Grenache Blanc, Viognier, Roussanne. Light straw color, subtle pear and apple aromas with earth and mineral notes, fairly rich mouthfeel with smooth finish.Poured at the Rhône Valley Wines table. 2008 “Version,” Saint Peray. 100% Marsanne. Very light color, melon and mineral notes, smooth on the palate with moderate acidity. 2008 “Mairlant,” Saint-Joseph Blanc. 70% Marsanne, 30% Roussanne, with 30% new oak. Slightly darker color than the “Version,” with similar aromatics along with an oak spice component, and a bit more weight in the mouth. 2008 “Les Contours de Deponcins” Viognier, Vin de Pays Collines Rhondaniennes. Very light color, perfumed, floral, with lots of upfront stone fruit and tropical fruit, medium mouthfeel and smooth finish. 2008 “Les Terrasses du Palat,” Condrieu. Light color, less fruit-forward and less floral than the VdP Viognier, with more citrus and chalky mineral character, lively on the palate, very nice. 2008 “Les Grand Vallon,” Condrieu. This wine has more new oak than the “Les Terrasses du Palat” bottling, and it showed it, with more apparent vanilla on the nose, plus more richness in the mouth. 2008 “Deponcins,” Condrieu. Although this uses the highest percentage of new oak of the three Condrieu bottlings, it showed it less than the previous wine. Nicely balanced and fairly rich on the palate, nice example of this style of Condrieu. 2008 “La Diligence” Marsanne, Stagecoach Vineyard, Napa Valley. Light color, displaying more new vanilla/oak and riper fruit, not surprisingly this was distinctly “New World” in style compared with the other Villard whites. 2007 “Mairlant,” Saint-Joseph. Medium purple, intense grilled meat aroma along with dark fruits, medium-bodied with good acidity. 2007 “Seul en Scène” Syrah, Vin de Pays Collines Rhondaniennes. Similar to the “Mairlant” but more intense, plus a notable spice component and more weight in the mouth, very nice. 2007 “Le Gallet Blanc,” Côte Rôtie. Medium-dark color, plum, spice, and oak, mouthfilling texture with grippy tannins. 2007 “Reflet,” Saint-Joseph. Very dark color, more earthy character with rare meat and iron components plus a mineral note. A big and muscular wine, this has the potential to develop into something special. 2007 “La Diligence” Syrah, Stagecoach Vineyard, Napa Valley. As with the “La Diligence” white, this was riper than the Rhône wines, with a more dense texture and a noticeable oak overlay. 2007 Le Soula Blanc, Vin de Pays des Côtes Catalanes. A blend of a number of varieties, including Grenache Blanc, Marsanne, Chenin Blanc, Sauvignon Blanc. Very light straw color, with subtle citrus and melon notes along with a mineral component. Very lively mouthfeel and clean finish. Poured at the Paul Young Fine Wines table. 2007 Saint-Joseph Blanc. Light color, showing subtle white peach aroma along with some oak notes. Lively on the palate with a smooth finish. 2008 Condrieu. Very light straw color, stone fruits with a perfumed, floral component and a stony minerality. Beautiful balance, nice texture in the mouth, and a tasty finish, a very fine Condrieu. 2007 Saint-Joseph. Medium color, smoky, plummy fruit with spice overtones, moderate weight on the palate and not too tannic. 2007” Santa Barbarine,” Santa Barbara County. Medium-dark color, more upfront blueberry/plum fruit, with very good acidity and structure. 2006 “La Barbarine,” Côte Rôtie. Medium-dark color, black fruits and spice with a gamy, meaty element as well as a pretty floral note, great texture with fairly big but not harsh tannins, very nice. Comments: The “Santa Barbarine” was sourced from Demetria Vineyard in Santa Barbara County, and aged in Domaine Gangloff’s barrels. 2008 Syrah “La Rosine,” Vin de Pays des Collines Rhodaniennes. Medium-dark color, very pretty aromatics, dark fruits, spice, and subtle floral notes, bright and pure on the palate, lively finish, nice. 2007 Côte Rôtie. Dark color, very intense nose of black fruits, smoke, and iodine, along with meaty and peppery components, big but not heavy in the mouth and well-structured for the long haul, very nice. Comments: Most of these wines were poured at the Friday morning seminar – see the separate linked report. Overall, this was an exceptional group of wines, and I’d say the standout producer of the event. 2008 Condrieu. Medium-light yellow color, citrus and white peach with a light touch of oak spice, some mineral notes on the palate, lively and fresh, very nice. 2009 Saint-Joseph Blanc. Barrel sample. 100% Roussanne. Slightly darker yellow, more subtle fruit aromas than the Condrieu, honey, melon, a richer texture but still good acidity. 2008 Saint-Joseph, Clos de Cuminaille. Medium-dark color, complex aromas of raspberry, spice, caramel, coffee, and grilled meat, bright acidity in the mouth, with big chewy tannins. Already a very attractive wine, this should age beautifully. 2008 Côte Rôtie. 90% Syrah, 10% Viognier. The Viognier component was clear in the nose, very fragrant, pretty aromatics along with darker fruits and some underlying vanilla/oak, this had great acidity and big but not harsh tannins on the finish. 2008 Cornas. Dark color, with some initial reductive funk that blew off quickly. Intense gamy, meaty notes along with plum and darker berry fruits, big yet lively on the palate, and grippy tannins, terrific Cornas. Comments: Noted California winemaker Shane Finley stood in for Pierre Gaillard at the tasting, as Gaillard was not able to make it to the US due to the ash cloud from the Iceland volcano. Since Shane worked at Domaine Pierre Gaillard for a year, he was a perfect guest host for pouring the wines. The wines were outstanding, probably the best overall line-up next to Domaine Ogier. 2009 “Confidentialle” Rosé, Côtes de Provence La Londe. 40% Mourvèdre, 30% Grenache, 30% Cinsault. Light salmon color, strawberry aroma with some savory and spicy elements underneath. Refreshing acidity with a tasty, lip-smacking finish, very nice. Poured at the Paul Young Fine Wines table. 2007 “Vertige,” Condrieu. Light straw color, stone fruit, minerals, with lots of ginger/spice. Fairly rich mouthfeel and smooth finish. 2007 “Les Serines,” Saint-Joseph. Dark color, black fruits, black pepper, along with a grilled meat component, medium-bodied with a bright, tangy finish, nice. 2007 “Terres Sombres,” Côte Rôtie. Dark color, more closed aromatics, more weighty on the palate with huge, grippy tannins – a big wine that needs lots more time in the cellar. 2009 “Meskeoli,” Cimerron Vineyard, Cochise County, Arizona. 25% Viognier, 26% Riesling, 18% Roussanne, 18% Picpoul Blanc, 8% Muscat, 4% Malvasia. Light color, floral and ripe tropical fruit aromas, moderately rich and a bit sweet on the palate, smooth finish. 2008 “El Campo,” Pronghorn Vineyard, Sonoita, Arizona. Mostly Mourvèdre and Tempranillo, plus Petit Verdot, Grenache, Syrah, Petite Sirah, and Roussanne. Medium-dark color, ripe red fruit and plum, fairly straightforward and pleasant enough red blend, though there was an odd note that sneaked in on the finish. 2007 Syrah, Santa Ynez Valley. Dark color, dark berry fruit with coffee, spice, and undertones of gamey meat, fairly rich on the palate with medium-big tannins, nice. 2007 “MJM,” California. 96% Syrah, 3% Grenache, 1% Viognier. Dark color, black fruits with a bit more lift in the aromas than the Syrah, plus a mineral note and oak undertones. Livelier mouthfeel than the Syrah and more tannic on the finish. 1986 Reserve Shiraz, Paarl, South Africa. (see seminar TN on this wine) See the separate Friday seminar report. 2009 “Monkey Wrench,” Paso Robles. 50% Grenache Blanc, 50% Viognier, made entirely in stainless steel. Light straw color, bright apply fruit on the nose, medium-bodied with a rich, smooth finish. 2007 Mourvèdre, Ohana Vineyard, Paso Robles. All native fermentation, about 15% new oak. Meaty, earthy raspberry/plum and dried herb aromas, fairly big wine with a good tannic bite on the finish. 2006 “Superfino Goloso” Syrah, Ohana Vineyard, Paso Robles. 100% Syrah. Dark color, black fruits, coffee, and spice, rich mouthfeel and medium tannins. 2009 Rosé, Dry Stack Vineyard, Bennett Valley. Saignée of Syrah and Grenache along with 10% Viognier. Medium-light pink color, pretty floral aromatics with strawberry and melon notes, crisp and refreshing. 2008 “The Muldoon,” Dry Stack Vineyard, Bennett Valley. 57% Syrah, 43% Grenache, will not be released until next year. Dark color, intense blueberry/boysenberry fruit along with chocolate and oak overtones, rich mouthfeel with a lively, tannic finish. 2008 Syrah, Marie’s Block, Dry Stack Vineyard, Bennett Valley. Will not be released until next year.Dark color, very floral aromas along with savory notes and black fruits, big, lush texture with youthful tannins. 2006 Gigondas. Medium color, somewhat closed plummy and leathery aromas, and a bit thin on the palate. Not showing much at the moment, perhaps it’s just in an awkward phase right now. 2005 “Brune et Blonde” Côte Rôtie. Medium-dark color, some funk in the aromas that blew off, revealing gamey dark fruit underneath. Medium-bodied with fine tannins on the finish. 2007 Syrah, Dry Stack Vineyard, Bennett Valley. Dark color, intense dark fruit aromas along with spice, mocha, and black pepper notes, lively acidity with great balance, and refined tannins on the finish, very nice. 2007 Syrah, “Kalen’s Big Boy Blend,” Sonoma County. Dark color, more bold and ripe aromatics than the Dry Stack bottling, with some hints of earth and grilled meat. More dense on the palate but still well-balanced, with grippier tannins. 2008 Syrah, Dry Stack Vineyard, Bennett Valley. Barrel sample. Didn’t write much on this one, other than big, dark, and tannic! 2009 “Côtes de Paso Blanc,” Paso Robles. Light color, fresh pear and stone fruit aromas with spice undertones, crisp and refreshing in the mouth with clean finish, nice. 2007 Syrah, Paso Robles. Dark color, black fruits with oak on the nose, quite dense on the palate with big, grippy tannins. 2006 Viognier, Cedar Lane Vineyard, Arroyo Seco. Light color, ripe stone fruit with subtle floral notes, good acidity and a smooth finish. 2008 “el Papé,” Central Coast. 75% Grenache, 20% Mourvèdre, 5% Syrah. Medium-light color, bright strawberry and red fruits, tingly acidity in the mouth and a long, tangy finish. 2008 “Auction Lot,” Central Coast. Barrel sample. Blend of Syrah, Mourvèdre, and Syrah from Hug Cellars, Herman Story, and McPrice Myers – the Hug component is Terry Hoage Vineyard Syrah. Dark color, black fruits, chocolate, and spice, very rich mouthfeel and long finish. 2008 Grenache, “el Maestro,” Central Coast. 80% Grenache along with Mourvèdre and Syrah, sourced from Cedar Lane, Terry Hoage, and Santa Barbara Highlands. Medium color, raspberry, plum, and spice, medium-bodied with good structure and chewy tannins. Comments: The ’08 wines are showing their youth right now, but given some time in the cellar they could blossom into a some very fine wines – I think the “el Maestro” has the most potential for the long haul. 2007 “Tessa’s Cuvée,” Paso Robles. 68% Syrah, 32% Cabernet Sauvignon, both from Booker Vineyard. Very dark color, ripe dark fruits, cedar, and lots of chocolate. Dense, sweet fruit on the palate with big youthful tannins. 2007 “Mary Jane’s Cuvée,” Paso Robles. 40% Mourvèdre and 30% Syrah from James Berry Vineyard, 30% Grenache from Terry Hoage Vineyard. Dark color, ripe blueberry and plum, chocolate, and spice, very rich mouthfeel yet with some balancing acidity, fairly tannic on the finish. 2008 “White Wine Blend,” California. Chardonnay, Marsanne, Pinot Gris, Riesling, Malvasia Bianca, Sauvignon Blanc and Viognier. Light straw color, slightly perfumey stone fruit and loads of spice, plus a leesy note, viscous mouthfeel with smooth finish. 2008 “La Provençale,” California. Syrah, Grenache, Carignane, Mourvèdre. Medium purple color, ripe plums along with smoked meat and oak components, mouthfilling texture with a big, tannic finish. 2008 Grenache Blanc, Thompson Vineyard, Santa Barbara County. Made in about 50% stainless steel and 50% older oak. Light color, bright apple/pear fruit, crisp acidity and refreshing finish, very nice. 2007 Mourvèdre, Thompson Vineyard, Santa Barbara County. Blended with a little Syrah. Medium-dark color, earthy berry/plum aromas with very good acidity and balance, medium-bodied with moderate tannins. 2007 Syrah, Thompson Vineyard, Santa Barbara County. Dark color, dark fruits, earth, pepper, and coffee, fairly rich on the palate with a grippy finish. 2001 Syrah, Thompson Vineyard, Santa Barbara County. Medium-dark color, pretty aromatics showing some savory notes along with plum and earth, and big tannins still very apparent. 1999 Syrah, Bien Nacido Vineyard, Santa Maria Valley. Slightly lighter color, aromas of dark berry fruit, black pepper, and spice, with great texture and balance, this is aging beautifully. 2007 “Upslope” Syrah, Santa Barbara County. Made from the winery’s best six barrels each year. Bold dark fruit and pepper on the nose, big and muscular character, long finish with only moderately big tannins. Comments: Craig Jaffurs told me that the apparent focus on Thompson Vineyard wines at this tasting was unintentional, but that these were selected to pour as they were all showing well. The ’08 Grenache Blanc was from the first harvest of that variety at Thompson Vineyard. The older vintages of Syrah demonstrated how well the Jaffurs wines can age. 2006 “La Sangre de Jonata,” Santa Ynez Valley. 98% Syrah, 2% Viognier. Very dark color, with savory dark fruit and earth on the nose, big and dense with very grippy tannins. 2007 “La Sangre de Jonata,” Santa Ynez Valley. Very dark color, showing blackberry, grilled meat, spice, and mineral elements, tightly-wound with great structure for aging, nice. 2007 Viognier, Paso Robles. Very aromatic ripe peach and tropical fruit aromas, smooth mouthfeel yet with good balancing acidity, tasty finish, nice. 2007 Syrah, Glenrose Vineyard, Paso Robles. 90% Syrah, 10% Viognier. Distinct floral notes along with ripe plum and darker fruits, moderately rich on the palate with medium tannins on the finish. 2008 “Hapa Blanc,” Santa Ynez Valley. 60% Grenache Blanc, 40% Roussanne. Light gold color, ripe stone fruits and spice with a rich mouthfeel and smooth finish, nice. 2007 Grenache, Tierra Alta Vineyard, Santa Ynez Valley. Medium color, bright red fruits and loads of spice on the nose, lively acidity and moderate tannins. 2007 Grenache, Larner Vineyard, Santa Ynez Valley. Medium-dark color, deeper fruit along with more weight on the palate, nice structure with a more tannic finish. 2007 “Hapa,” Santa Ynez Valley. 60% Syrah, 30% Grenache, 10% Mourvèdre. Dark color, floral notes along with dark fruits and dried herbs, full-bodied with chewy tannins. Comments: Solid line-up of wines Mikael Sigouin, who’s also the head winemaker at Beckman. 2006 “Osiris,” Paso Robles. 56% Grenache, 24% Mourvèdre, 20% Syrah. Medium-dark color, earthy red fruits plus smoky grilled meat and dried herb aromas, rich texture in the mouth with fairly big tannins, nice. 2006 “Morpheus,” Paso Robles. 60% Syrah, 26% Grenache, 14% Mourvèdre. Darker color, with more purity of darker fruits on the nose, plus a more noticeable oak component, a big wine with a grippy finish. 2006 Saint-Joseph, Medium-dark color, complex aromas of raspberry, spice, caramel, coffee, and grilled meat, bright acidity in the mouth, with big chewy tannins. Already a very attractive wine, this should age nicely. Poured at the Rhône Valley Wines table. 2002 Syrah, Mount Veeder, Napa Valley. Medium-dark purple, with bright blackberry and black pepper aromas. Still showing lots of fruit, with a distinct savory component that comes through more in the mouth. Lively finish with tannins that are resolving nicely. This seems like it’s starting to hit its prime drinking window. Comments: This was a nice opportunity to taste an older Lagier Meredith Syrah. I had tasted their more recent Syrahs and their Rosé at the Rhone Rangers tasting in March so I did not taste them again here. 2008 “La Petite Ruche,” Crozes-Hermitage. Medium-dark color, meaty/gamey notes with plums, berries, and earth on the nose, medium-light bodied and not too tannic. Poured at the Rhône Valley Wines table. 2008 Syrah “Cinematique,” Larner Vineyard, Santa Ynez Valley. Very dark color, super-intense aromas of dark berries, coffee, clove/spice, rich mouthfeel but not heavy, long finish with medium-big tannins. 2008 Syrah “Il Padrino,” Bien Nacido Vineyard, Santa Maria Valley. Very dark color, more noticeable black pepper character along with blackberry and smoked meat components, and more structure than the “Cinematique” with a grippy finish. Comments: Paul Lato’s Syrahs show that even big, decadent wines can reflect their origins, as these two ’08 wines showed remarkably consistent character compared with their ’07 predecessors tasted last year. 2009 “Contrarian,” Paso Robles. 65% Viognier, 15% Roussanne, 12% Grenache Blanc, 8% Picpoul (last two from Linne Calodo’s own vineyard). Very light color, ripe stone fruit, medium bodied with good acidity and smooth finish. 2007 “Sticks & Stones,” Paso Robles. 63% Grenache, 25% Mourvèdre, 12% Syrah. Medium-dark color, ripe red fruits with some earth and spice notes, great acidity and texture, with a tangy finish, nice. 2007 “Slacker,” Paso Robles. 68% Syrah,16% Grenache, 16% Mourvèdre. Darker color with a darker fruit profile and more spicy oak. Bigger on the palate with firm tannins. 2007 “Nemesis,” Paso Robles. 80% Syrah,15% Mourvèdre, 5% Grenache. Dark color, ripe blueberry and earth, with clove/spice undertones. Dense but not heavy, with grippy tannins, this one needs some extended time in the cellar. Comments: Matt Trevisan’s wines are unmistakably in the big, Paso style, but their complexity and liveliness helps them to stand out from the crowd. 2008 “White Blend,” Swartland, South Africa. Viognier, Grenache Blanc, Clairette Blanc, Chenin Blanc. Light color, bright stone fruit and pear on the nose, medium-bodied with refreshing, clean finish, nice. 2008 Syrah, Swartland, South Africa. (see seminar TN on this wine) See the separate Friday seminar report. 2007 Roussanne, Bien Nacido Hillside Estate, Santa Maria Valley. Light color, showing stone fruit and oak spice, with a medium-rich mouthfeel. As usual with Qupé whites, this one deserves some extended aging to show its best. 2000 Roussanne, Bien Nacido Vineyard, Santa Maria Valley. Light-medium yellow in the glass, this showed exactly why Qupé Roussannes demand time in the cellar. It’s lost the oaky edge that young Qupé whites can show, and gained increased weight on the palate along with the honeyed and slightly nutty character of an older Roussanne. 2006 Syrah, Bien Nacido Vineyard X Block, Santa Maria Valley. Medium-dark color, big aromas of dark fruits, spices, and roasted meat, lively mouthfeel, with huge, puckery tannins on the finish – needs lots of time but has all the components to age into something special. Comments: Bob Lindquist pours an older white at HdR just about every year, and it’s a treat to taste how they’ve evolved – this year was no exception. 2005 “Columella,” Swartland, South Africa. 80% Syrah, 20% Mourvèdre. (see seminar TN on this wine) See the separate Friday seminar report. 2008 “Broken Stones,” Paso Robles. Barrel sample. Dark color, ripe blueberry and spice, rich mouthfeel with big, chewy tannins. 2008 Syrah, Booker Vineyard, Paso Robles. Barrel sample. 92% Syrah, 8% Mourvèdre. Intense, ripe dark fruits with earth and vanilla/oak undertones, big and dense on the palate with a moderately tannic finish. 2008 “Bone Rock,” Paso Robles. Barrel sample. Mostly Syrah with a little Mourvèdre and Grenache, 75% stem inclusion, 52-day maceration. Most complex aromas of the three barrel samples, with stemmy/spicy notes along with blackberries, mocha, and earth. Very tight and tannic right now. Comments: Justin Smith was pouring barrel samples and they were showing quite young, but all three show the promise for developing into the type of wines Saxum has become known for. 1994 Syrah, Stellenbosch, South Africa. (see seminar TN on this wine) See the separate Friday seminar report. 2009 Rosé, Estate, Paso Robles. Medium-light pink color, fairly straightforward watermelon and spice notes with a refreshing finish – not bad, but not the best Tablas CreekRosé I’ve tasted. 2008 “Esprit de Beaucastel Blanc,” Estate, Paso Robles. Light yellow color, melon, stone fruit, and honey with a stony mineral note. Bright yet rich in the mouth, with a long smooth finish. 2007 “Esprit de Beaucastel,” Estate, Paso Robles. Medium color, showing grilled meat, black cherry/plum, dried herbs, and earth on the nose, this had a lively mouthfeel and good structure, nice. 2008 Côtes du Rhône Blanc. Grenache Blanc, Viognier, Clairette. Light color, bright, floral apple and stone fruit aromas, crisp acidity with a long smooth finish.Poured at the Rhône Valley Wines table. 2006 “Descendant,” Barossa Valley. 92% Syrah, 8% Viognier. Very dark color, dark fruits with black pepper, spicy oak, and some lightly floral notes. Nicely-balanced in the mouth with a grippy finish. 2006 “The Pict,” Mataro, Barossa Valley. Medium color, earthy, gamey aromas with plum and black cherry fruit, and well-integrated smoky oak. Medium-bodied with fairly big tannins, very nice. Comments: Though I tasted only two of the Torbreck wines, these were among the most well-balanced and impressive ones I’ve tried in recent years. 2005 “Syrah Mourvèdre,” Tulbagh, South Africa. 80% Syrah, 20% Mourvèdre. (see seminar TN on this wine) See the separate Friday seminar report. 2007 “Tache le Verre” Syrah, Santa Barbara County. Medium-dark color, fairly ripe dark berry fruit with earth and herb notes, nice texture on the palate with a grippy finish. 2007 Côtes du Rhône. Medium color, bright red fruits on the nose, nice texture. Fairly simple, straightforward CdR. Poured at the Rhône Valley Wines table. 2007 Roussanne, Round River Ranch, Lake County. Medium-light yellow color, showing leesy, waxy stone fruit aromas, medium-rich texture with a lively finish. 2007 “L’Imaginaire” Grenache, Santa Barbara CountyLight reddish-purple, bright red fruits and spice on the nose, tingly acidity with good balance and finish. 2007 “L’Intruse” Mourvèdre, Santa Barbara County. Dark color, with meaty, earthy plum fruit aromas. Medium-bodied with good structure and balance, moderate tannins on the finish, very nice. 2007 Syrah, Las Madres Vineyard, Carneros, Sonoma County. Dark color, dark fruits with dried herb and mocha notes, lively on the palate with medium tannins. 2007 Syrah, Alder Springs Vineyard, Mendocino County. About 20% whole cluster fermentation. Dark color, displaying red fruits with black pepper and herb notes. Very good acidity with grippy tannins. 2007 Syrah, Thompson Vineyard, Santa Barbara County. Dark color, with earthy, dark fruit aromas, nice depth and texture, with a firm, chewy tannic finish. 2007 “Les Amours”, Santa Barbara County. 80% Syrah from Thompson and White Hawk vineyards with Grenache and Mourvèdre from Alta Mesa Vineyard. Dark color, brighter fruit profile than the Thompson Syrah, with some spice and mineral notes, dense but not heavy on the palate, finishing with big tannins. Comments: I thought the Santa Barbara County wines stood out in this solid line-up. (Disclosure – I did some work during the ’09 crush for VIE). 2006 Domaine des Santonilles, Côtes du Rhône Villages. Medium color, high-toned red fruit aromas with spicy, savory notes. Bright acidity on the palate. Poured at the Rhône Valley Wines table. 2006 Syrah “Cuvée Ameena,” Stellenbosch, South Africa. Medium-dark color, plums and a big component of smoked meat/bacon on the nose, lively mouthfeel and fine tannins on the finish. 2007 Syrah, Bennett Valley. Dark color, intense aromas of ripe blueberries and some oak spice, lush mouthfeel and big but refined tannins on the finish. 2008 “Rana,” California. Grenache from James Berry, Booker, and Castelli-Knight, Mourvèdre from James Berry, and Syrah from Clary Ranch. Medium color, intense raspberry fruit, very pretty and fruit-forward, but with good structure. 2007 Syrah, Sonoma Coast. Sourced from several vineyards. Dark color, big aromatics of black fruits with stemmy/spicy and subtle savory components. Lively mouthfeel with good acidity and medium-full tannins, very nice. 2007 Syrah, Castelli-Knight Ranch, Russian River Valley. Dark color, lots of dark berry fruit and black pepper, more density on the palate than the other two wines with big, chewy tannins. Comments: Wind Gap’s ’06 Sonoma Coast Syrah was one of my favorites from last year’s event, and the ’07 followed suit this year.